If I could marry this book, I would. I can finally say that I fully understand why people have been SO obsessed over this book, it's completely off the grid amazing! 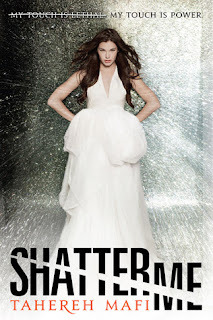 I bought Shatter Me when it first came out but was afraid I wouldn't like it for my expectations were so high, what with everyone non-stop buzzing about it, but then I didn't read it because I didn't wanna have to wait for the second book to come out in case I DID love it as much as I wanted to. And I did, love it just as much as I'd hoped and thank god I waited until the second book came out so now I don't have to wait! I had heard so many people talk about Tahereh Mafi's unique, poet, etc. writing style, so I wasn't completely sure what to expect going in, but actually I really loved her writing style. It was so easy to feel like you really got into Juliette's mind set. At first she did kinda seem like she was off her rocker, but slowly, as SHE realizes she's not crazy, so do you without even realizing it. I felt like I grew right along with her, as she discovered herself and realized there was more in the world than she thought. I LOVED this book. And I loved Adam. I thought he was wonderful. Which is why I'm a bit nervous about reading Unravel Me!! I totally know what you mean!